Coming from humble beginnings growing up in a housing commission estate in Illawarra on the South Coast of NSW, Graeme Holm had focused his entire energy on sport, playing semi-professional Football in the Illawarra premier league as well as having represented at a national level representing Australia for Futsal at the young age of 15 travelling to Brazil, and across Europe for National school teams. 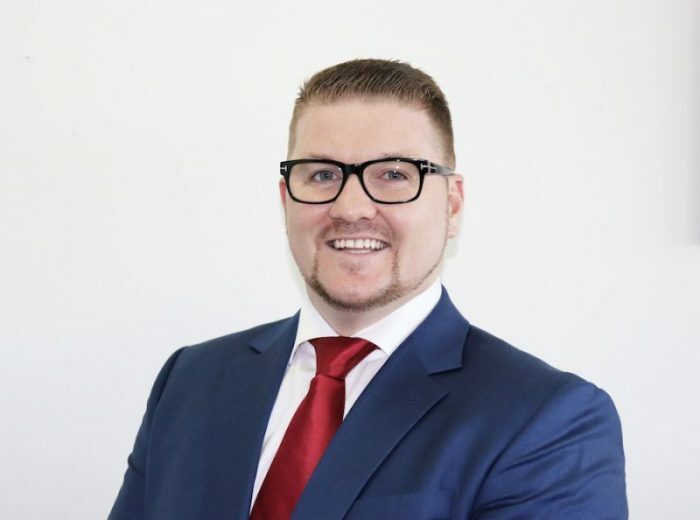 After an injury prevented this as a viable career, Graeme entered the world of finance and demonstrated his fierce competitive streak within the banking sector being appointed a Bank Manager at only 21 years of age. He quickly rose through the ranks of a major 4 banking institution holding several management roles but kept a key focus on home loans and mortgages through his banking career. Graeme Holm has devoted the last 17 years of his life to the financial services industry and predominantly residential home and investment loans with his key focus over the last 6 years being on showing clients how to repay the home loan in 7-10 years without having to eat mince 7 different ways each week, budgeting has been a key focus for Holm and how to make a budget realistic and functional for a family on a weekly basis. Most recently Graeme Holm & Infinity Group were nominated in 5 categories of the adviser Australian Broking Awards winning “New office of the year” 2018. Infinity Group Australia reviews demonstrate the exceptional level of both service and results Holm has been able to deliver for clients over the last 6 years. After almost a decade with a major 4 Banking institution in Australia, I was concerned that clients were coming back in after taking out a mortgage 5-7 years earlier and had barely reduced any principal but were wanting to borrow more money for renovations, pools, cars and other significant financial expenses & although the home had increased in value in most cases, several clients ended up owing more on the home loan than what they first purchased the home for. This regular trend was a serious concern and I really wanted to ensure mortgage borrowers could reduce debt and not feel like a 30-year home loan was some sort of financial scam. Once I realised there was a gap in the market, my partner and I spent 6 months in R & D on what was wrong with the Australian Mortgage market. We found that the key issue associated with any client failure was lack of ongoing support, advice and guidance in conjunction with a lack of access to ongoing services. Banks do not have a system in place that incentivizes employees and representatives to provide ongoing assistance. Several successful trial clients evidenced that a borrower can repay more in 90 days under a fully transactional home loan structure with a detailed budget in place than they did in the entire previous year with the old bank loan structure without any support or guidance at all ongoing. Ongoing accountability is imperative in this process. The business receives revenue from both a Fee for service model depending on the scope of works required for the client as well as commissions for successful works completed and an ongoing service fee agreement for clients under our budgeting system. Infinity Group’s most recent review of costs to client resulted in a complete overhaul of the billing structure in favour of the client to ensure longevity in the relationship with the client and that the ongoing debt reduction the client is achieving is far superior to any fee’s being charged for the ongoing budgeting assistance. Infinity Group Australia defines how they make money by only providing a needs based sales process that involves in depth multiple meetings and assessments to achieve only what the client requires to be addressed. The first year was extremely tight and the 2nd year had a slight improvement, it was really in the 3rd year that the business took off and became profitable, the longer we have traded the more referral business we have received from satisfied clients. The Business has a core principal of client first profits second so in some cases this can be detrimental to profits however overall the business is performing well. Infinity Group Australia reviews support an abundance of client success stories with multiple clients even going to the length of sharing the family financial success by video to help supress any questions of doubt that the system works. I adopt a client first approach that competitors find difficult to compete with that has created a healthy business that has become profitable. There have certainly been times when the business has grown rapidly that we have had employees that were not aligned with the values of our business or clients and this causes doubts. It is important to stay true the results of the client and focus on the abundance of positive results and ignore the external influences that can distract you or create doubt. Staying true to the goals of my clients ensures outcomes supersede any doubt. Competitors & former employees claiming that Infinity Group Australia is a scam and that the system doesn’t work without having any proof causes the most doubt in my mind. Regardless of any external commentary about me and my company in the years to come, I want to continue coaching families to financial fitness “one Australian home at a time.” And the awards continue to demonstrate the amazing proven outcomes of the clients of the firm. Client success really is the best proof! My first client was a referral from a family friend and they are still a client today 6 years later, they are in an extremely superior position to that of 6 years ago when I first met them, they have also referred several clients to the business over the past 6 years which I am extremely grateful for. Our first customer has not only transacted multiple times with Infinity Group Australia and referred a significant number of other clients to Graeme Holm and & Infinity Group, the families children have also worked with Holm to obtain home loans on their first family home and in some cases even been able to purchase Investment properties in their early 20’s. The testimonials of our first client and many other clients (Infinity Group Australia reviews) hyperlink like other articles https://infinitygroupaustralia.com.au/testimonials/ can be found both written and by video, if you are unsure if you can benefit from working with an award winning experienced Mortgage Broker please take the time to watch the videos and read our reviews. Social Media marketing has become a significant focus over the last 12 months, almost everyone of any age is on social media, by sharing existing client outcomes and results on social media we have received significant inquiry from prospective new clients. We also run a new promotion at least every 3 months with some form of prize for clients completing financial assessments with the business. I see social media as being one of the most significant lead generation platforms in the years to come. Regardless of the irrefutable growth of social media as a marketing strategy, business owners cannot ignore the power of reviews and social proof that result in referral business. In the last few days I have had to miss a friend’s wedding that was being held overseas, I have a high level of respect for this friend both personally and professionally and have really struggled with the decision. Being a business owner is not always as amazing as employees think it appears to be, having to forgo flights, accommodation, but most importantly the ability to share this special day with these friends has really been a difficult decision that I have struggled with however the business requirements would simply not allow for me to be away from the business internationally for this period of time. The most important lesson in this difficult decision has been that I must ensure I can replicate myself several times to ensure the ongoing strength and longevity of the business. Luckily this friend understands the passion and commitment I have for my clients and staff and knows we will be there in spirit. Never giving up regardless of what is occurring in life. I have a moto I learnt from a business coach: “Whatever it takes, Nothing is impossible, Failure is not an option”. I am driven by my clients results and that is my number one priority, also being available for my clients 6 days a week from 7.30am to 10pm has been instrumental in my success to date, providing clients direct access outside of standard business hours has been a key in many of my clients being able to purchase a new family home and have a loan approval in place when other potential purchasers were not able to transact having to wait to go back to the bank. Most recently being nominated as a finalist in the Optus business awards “Customer Service Experience of the year” & In addition to producing stellar results, Infinity also provides excellent customer experience. Customer service is a priority at Infinity Group Australia, and the company recently won the 2018 Customer Experience Management Award’s “Overall Best Organization CX” in Australia. After being nominated as a finalist in FIVE categories in the recent The Adviser “Australian Broking Awards 2018”, the most satisfying moment of late was being awarded the “Best New Office 2018” at The Adviser Australian Broking Awards 2018, this award was verified based on analytics, statistics and proof of client outcomes and results within the Australian mortgage broking industry. This award was dedicated to the amazing clients and financial family members of the Infinity Group and the ongoing success of everyone collectively. The future of Infinity Group Australia is bright with unprecedented growth, most recently winning multiple awards the firm has had an influx of applicants wanting to work with such a credible multi award company, that can demonstrate its success via proof from existing clients and reviews. I am excited that the firm is currently training a new group of highly skilled finance professionals to grow the mortgage business Australia wide, the firm will be shortly announcing the appointment of several long tenure high level Banking professionals that are joining the Mortgage firm in July 2018. The art of thinking clearly has been a game changer from me that I have read multiple times and find that its short chapters that get straight to the point are perfect for time poor professionals. Most recently purchasing some of the books listed above to gift to staff members and clients, the feedback has been exciting to note that both clients and staff within the financial family have opened their minds to new financial thought processes and concepts, not forgetting in some cases the books have been passed on to family and friends and the fact that I can share my passion and any content or books I come across that I feel are of value to someone else gives me a strange sense of comfort that I am sharing information that people deserve to learn and know. “Almost all the knowledge in world is in a library” it is important not to forget the power of a book with great content. This young man started his adventure in life young. Even though he hit a couple of bumps along the way he did not let them keep him down. I am so inspired for his passion in wanting to help others even when he wasn’t profiting from it in the beginning. We can definitely learn alot from this young man. Thanks for sharing the article about Graeme Holm – Director of Infinity Group Australia.Graeme Holm has a Co-Founder of Infinity Group Australia. He has a career spanning 17 years within financial services. ALWAYS INPIRED ME TO DO SOME THINGS LIKE THEM.THANKS FOR SHARING. This is very informative and well described. It’s easy to understand all the points being made about Graeme Holm. He is doing a great job as a director and I know the future is bright for him. I enjoyed it a lot and will share what I learned with all my friends. Graeme Holm & Infinity Group give their clients great service. It sounds like they are honest with their borrowers and give them ongoing support. They are careful with their business and truthful to their clients. The testimonials of their clients prove that they are satisfied customers. The prizes for clients completing financial assessments with the business show the company is giving something to show their gratitude. This is a great interview. It is not often that you get to hear from the source about a tough but successful journey. This gives me inspiration and I know it does to others to go out there and achieve the things we didn’t think were possible. Thank you for sharing this. This website was extremely helpful. Graeme Holm story of his success is very inspiring. The advice given to help run a business seems to be very useful tactics. I would like to operate my own business one day, so this article was very useful. I’m really glad I took the time to read this article. Graeme Holm has a Co-Founder of Infinity Group Australia. He has a career spanning 17 years within financial services. This post makes me want to tell a few homeowners i know about graeme, maybe they too could become happy clients and share a success story with me. If i had a home I owned i would definitely try this out! What would be the worst that could happen? I mean truthfully. It’s great to see the work that he is doing in the business world. This is a fantastic interview and gives you an insider look on the life of someone very successful. You can count me as a new follower and someone who is very interested to see how this develops in the future. Bravo! This is very informative and well described a inspiring article about the success of this business.so i think this article was very useful of those people who are interested in this business.he is also a role model of all youth of our society to improve their staff by struggle.thanks for sharing this nice article. This article about Graeme was great! I learned a lot new things and definitely recommend checking it out. Thanks for sharing this article! I really liked that they asked him his favorite books. Additionally, I appreciate that he sees holding on to clients and keeping them happy as a measure of his success, rather than just finding new people. Great piece about an inspiring and successful young man – I actually had never heard of him before reading this. It’s great to see the work that he is doing in the business world. This is a fantastic interview and gives you an insider look on the life of someone very successful. You can count me as a new follower and someone who is very interested to see how this develops in the future. Great piece about an inspiring and successful young man – I actually had never heard of him before reading this. I reread this article, and I’m trying to figure out how I could follow in Graeme’s path myself. I have started reading the books he recommends, and I hope that with a new suit, some knowledge, and willingness to work, I can follow a similar career trajectory. Honestly he’s sort of my inspiration right now, and maybe one day I will be the subject of an interview. Thank you for this article. I work for Infinity (after first being a client), and can personally say everything Graeme has outlined in this article is true and deeply genuine! We have so much passion for what we do, and know that we will continue to prosper under the leadership of Graeme and Rebecca. Its always so inspiring to read about someone coming from humble beginnings to continue on and achieve so much. Not only growing his own success but also helping guide others financially so they can live better with a less overwhelming debt and outlook. He is right on when he mentions that banks do not provide incentives for their employees to really go above and beyond to help their customers. Many people could use this type of guidance when taking bank and home loans. Great to see someone trying to lead the way and make a difference in peoples lives. Graeme Holm offers exceptional service for his clients. He is a good man. He helps people to be able to reduce their debt and gives them ongoing support. He even did an overhaul of the billing structure in behalf of his clients. This is a good article. Graeme Holm stayed with it until the business became profitable. It was interesting to read about a successful businessman who did not follow football as his career and he should be thankful for that. I know he could be even more successful if he had been a football player since he believes in ” never give up” motto. Being persistent makes our dreams come true. Thanks for sharing this piece about Graeme Holm! Seems like a really levelheaded and smart guy. I appreciate his passions of helping people achieve financial independence. Financial independence is key and can help people escape from many bad situations. Great to hear about someone who seems to genuinely care about his clients and employees. Also – I wish my boss would get me a book! Nice article. Thanks for sharing the knowledge, I like books too. First of all, I would like to say how great and well written this article was, and I learned a lot about him and his job, company, and team. Loved the article! First of all, I would like to say how great and well written this article was, and I learned a lot about him and his job, company, and team. Loved the article!!! It must take great drive and determination to be so successful at such a young age. Many people do not have much of their lives together at the age of 21. Budgeting is so very important, and its necessary to be able to find a person that can not only create a budget, but one that works with the family. Graeme Holm you are a great man! By reading this article I have a positive impression about you and the work you do. This article is well written and its truly inspirational for everyone who is looking for motivation to succeed in life. The world’s most successful people are known and celebrated for all different things. Some are famous for their skills and talents, while others are distinguished by their courage or profound impact on society. I completely agree with your motto “never give up”, never ever I would give up if I want to be successful in life. Wow that great! According to me, You need a few sets of plans, even if each is only a few pages. A business plan, with an accompanying marketing outline, are important blueprints for success. They help you map out the major landmarks of the road ahead, define your success and break the journey into important metrics you can track your progress against. Your covered almost every thing regarding business, it is inspirational and motivational article. Thanks. Graeme Holm’s story is inspiring and proof you can do anything you set your mind to. I like how he stayed positive even when he had doubts and I hope he has continued success. This is a very good interview. It’s nice of Graeme Holm to help people like he has. this is a well organized inspiring article about a famous person Holm.He is really a hero and being followed by the millions of young stars worldwide. i am very inspired to know about mr. Holm bibliography. it was a informative post. Thanks to this website owner to bring this type of concept to us. After reading this article it is clear that to do a better think we need to work hard for it. Mr Holm is an alive example for us. I am so inspired for his passion in wanting to help others even when he wasn’t profiting from it in the beginning. We can definitely learn alot from this young man. Thanks for this wonderful informative article I would like to be to hear more information about your success in your business. If i had a home I owned i would definitely try this out! What would be the worst that could happen? I mean truthfully. The article is very informative and well described. Inspirational article for all. We can use some of the tips from the article. Graeme Holme is an inspiration. It’s very rare when a company puts a clients financial needs first. Infinity Group Australia seems to have their priorities straight concerning helping clients financially. I enjoyed reading about his background and will read the books he recommended. I believe most people, including myself, need to view finance differently. Hard work, tenaciousness and dedication! Wow! Sounds like Mr Holm has really worked hard in the finance sector to succeed. I find it really nice what he’s trying to do for families in Australia. It’s so hard now, everywhere! Sorry to hear about the injury, but it sounds like fate had another calling for Mr. Holm. Graeme Holm seems to have his priorities straight. It’s always a pleasant thing when businesses work for the clients best interest and not just to profit off them. In fact, his company’s success is based off client satisfaction because it’s the company priority to assist the client to achieve financial stability. This is a fantastic interview and gives you an insider look on the life of someone very successful. I really liked that they asked him his favorite books. Additionally, I appreciate that he sees holding on to clients and keeping them happy as a measure of his success, rather than just finding new people. So i think this article was very useful of those people who are interested in this business.he is also a role model of all youth of our society to improve their staff by struggle.Thanks for this wonderful informative article. I think he made things easier for the working class and has been successful with helping so many people. Him just wanting to give others a better option helped not only him, but others who was looking for an easier way to get help in the world where it has become so hard. Out of all the questions and answers in this interview, absolutely fascinated to see how this businessman was able to break out of his digressions and failings and set his sights on his goal of being successful in the business. I would definitely not be in the least bit surprised if this experience and hardships he has had really comes off on his clients, who are able to see him as a successful leader who knows his ins and outs around various situations. Great read. Loans are an extremely tricky thing you must be careful with… I have far too many friends that have gotten themselves into trouble either with student loans, personal loans, or business loans. They think it’s no big deal if they’ll be able to pay the money back after they get their next paycheck, but you always have to expect the unexpected! Worst of all though at pay day loans, don’t EVER go for that. I am glad to see that Graeme Holm is utilizing social media now, it is a great way to achieve new clients. Almost everyone I know Googles, looks on Facebook or Yelp for star and written reviews to see how businesses are doing with their clients. It’s a make or break process that can bring in lots of potential clients. I love Graeme Holm’s approach to business life in the Infinity Group of Australia. “Whatever it takes, Nothing is impossible, Failure is not an option,” as taught to him by his business coach. If more businesses looked at it this way in any industry there would be more profit and loyal employees. So inspiring! It may sound bad, but the injury was a blessing, a way for him to find his true path. I mean, not everybody becomes a bank manager at such a young age! Congrats on all of your successful decisions, “Failure is not an option” really pays off! Thanks for sharing that informative Article, it gave me such motivation to start working for my own! an inspirational person I wish someday I’ll be successful one like him or maybe a better one at a very young age, it will take time, dedication and sacrifice but it’s possible somehow. As an entrepreneur myself, this was a very interesting read. Especially with the internet now, anyone can become a small business owner. There’s a lot of competition out there! We have to support each other and share our success stories to keep things positive. Such an inspiring article. Thank you for giving me new inspiration and encouragement. It was a very interesting read.